Why is there an international movement for boycott, divestment, and sanctions against Israel? With the publication of the Kairos Palestine Document in December 2009, Palestinian church leaders called on Christians around the world to explore boycott and sanctions against Israel and divestment from companies around the world that profit from the occupation. Palestinian civic leader Sam Bahour calls BDS a principal nonviolent response to the injustice perpetrated on Palestinians and invites all who seek justice to join this movement. With the failure of the U.S. government and international community to hold Israel accountable for its actions, BDS promotes time-honored and respected tactics used to achieve justice throughout history, including in the U.S. Civil Rights and South Africa Anti-Apartheid Movements. A nonviolent response to Israel’s violence against Palestinians. Grounded in universal human rights and international law. Aimed at institutions, never individuals. Boycott targets include consumer goods and complicit academic and cultural institutions. Divestment can be implemented by universities, churches, unions, pension funds and other institutions. Sanctions require ending U.S. military aid to Israel or penalties brought by governmental bodies and courts against Israel. How are decisions made to boycott certain products or to divest from certain companies? Provide products or services that contribute to the maintenance and construction of the Separation Wall. Boycott of goods and services from companies covered by the AFSC investment screen. Companies that provide products or services that contribute to the maintenance and construction of the Separation Wall. Boycotts of settlement products, and related activities. Boycotts of institutions, groups, or events that directly sustain or purposefully obscure the occupation and inequalities between Palestinians and Israelis. In making decisions regarding support for sanctions, AFSC is led by the guidelines laid out in the 1993 AFSC report titled “Dollars or Bombs: The Search for Justice through International Economic Sanctions”. This report included a series of guidelines developed by an AFSC Working Group on International Economic Sanctions that are designed to assist those considering supporting or opposing the use of sanctions. AFSC supports the cutting of military aid to Israel and cutting security assistance to Palestinian Authority forces responsible for human rights abuses. In addition to consumer boycotts of products made in the illegal Israeli settlements, there are many other products produced in Israel and Palestine that profit off of the occupation. Besides calling for institutions or individuals to divest from companies that promote and sustain the violence in Palestine, there are ongoing programs for academic boycotts and cultural boycotts against Israeli. So, in order to have an impact it is important that these divestment and boycott campaigns be coordinated among as many groups, institutions, and people as possible. Educate people in your group and beyond about the issues of Israeli occupation and encourage them to pledge to boycott certain products that are produced in illegal settlements in the Occupied Palestinian Territories. Participate in activities to exert economic pressure on Israel and U.S. corporations that benefit from the occupation. In addition, urge corporations to move production out of settlements, to be environmentally responsible, and to pay their employees living wages. Write and deliver letters to retailers and corporations that sell products made in the settlements asking them to remove such products from their shelves. Engage in direct actions and demonstrations at stores that carry products to be boycotted. Talk to friends and relatives about BDS efforts and ask them to pledge to participate in the boycotts and demonstrations. Ask government entities to stop using products made in the illegal settlements in the Occupied Palestinian Territories. Contribute reviews on Amazon and other companies dissuading purchasers from buying products made in the settlements. Have you read the Kairos Document? Still want more information? For a short introductory video see Jewish Voices for Peace’s animated introduction on our Background Video page. Learn about organizations working for justice in Israel-Palestine within the Anabaptist community, in North America, in other US based denominations, and in the Middle East on our Organizations page. The MCC Palestine blog is a great resource. If you are interested in continuing to study, reflect, and act see our list of Study Guides. Many of these can be used as Sunday School Curriculum. Film is a powerful medium. We invite you to screen Documentaries at your churches. See our list of recommended Documentaries. Keep up with the latest news in the region with these Media Resources. Requests for prayer can be found here. Will Bibi Destroy Al Khan al-Ahmar Before Elections? How Did Your Senator Vote on S1? Israel, money and anti-Semitism. A recent series of exchanges on social media among public figures painfully surfaced all three. A brief chronology might help.In early February Rep. Kevin McCarthy (R-CA) disciplined Rep. Steve King (R-IA) for outrageous white supremacy comments. But McCarthy also called on House Democratic leaders to discipline the two newly elected female Muslim members of Congress, Ohlan Omar (D-MN) and Rashida Tlaib (D-MI), for their support of BDS (Boycott, Divestment and Sanctions), claiming they are equal to King, “even more so.” After reading McCarthy’s challenge, prominent journalist, Glen Greenwald tweeted that McCarthy’s comparison of Omar and Tlaib to King was “obscene” and the threat to punish Omar and Tlaib was “stunning,” and an attack “on free speech rights of Americans.” Upon reading Greenwald’s tweet, Omar sent out her own tweet. 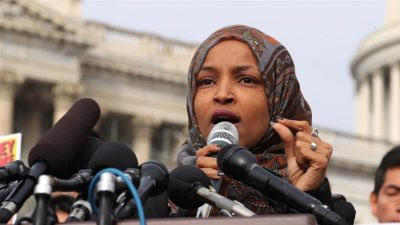 In a somewhat indelicate manner, Omar stated that McCarthy’s support of Israel was “all about the Benjamins,” alluding to a song by that name and with “Benjamin” referring to the U.S. $100 bill with the face of Benjamin Franklin. The bipartisan backlash was immediate and Omar quickly apologized for her insensitivity to anti-Semitic tropes, acknowledged that anti-Semitism was real, expressed gratitude to Jewish colleagues who are educating her to the painful history of anti-Semitic tropes, but reaffirmed her main point: “the problematic role of lobbyists in our politics, whether it be AIPAC [American Israel Public Affairs Committee], the NRA [National Rifle Association] or the fossil fuel industry. It’s gone on too long and we must be willing to address it.” While it is true that AIPAC is a nonprofit and therefore cannot lobby Congress or give money to congressional candidates, AIPAC, by its own admission, carries considerable influence in congressional circles. Hopefully, the main takeaway from this controversy may be the beginning of a more even-handed approach to the Israeli-Palestinian conflict within the halls of Congress. With Omar and Tlaib as the first Muslim women in Congress and open supporters of BDS, vocal support for Palestine will be ever present. And with the 2020 primaries approaching, there are signs that some of the Democratic candidates running for President will address Palestinian human rights, with Bernie Sanders the most prominent. Still, there is a long uphill road to climb. That is what intersectionality is all about. If you want to sign on individually or as an organization, or to read the full statement, click here. Alexander went on to write: “If we are to honor King’s message and not merely the man, we must condemn Israel’s actions: unrelenting violations of international law, continued occupation of the West Bank, East Jerusalem, and Gaza, home demolitions and land confiscations. We must cry out at the treatment of Palestinians at checkpoints, the routine searches of their homes and restrictions on their movements, and the severely limited access to decent housing, schools, food, hospitals and water that many of them face.” To read the entire article, click here. There is speculation that Israel’s Prime Minister, Benjamin Netanyahu (also known as Bibi), will destroy the Bedouin village of Al Khan al-Ahmar before Israel’s snap elections on April 9 to boost his chances among voters. His recent indictment on corruption charges will not help him. But if he does okay the demolition of Al Khan al-Ahmar, he will also be destroying the livelihood of 32 families of nearly 200 people. Located in the Negev desert outside Jerusalem, Al Khan al-Ahmar’s inhabitants descend from the Jahalin tribe and are mostly sheep and goat herders. Within the village are 160 structures with many homes, a mosque, a clinic and a school for 175 students that serves the Bedouin population of 1,400 people in neighboring villages as well. Two Israeli settlements, Ma’ale Adumim and Kfar Adumim, were built around Al Khan al-Ahmar. The impetus for the village’s demolition is the desire to expand the two settlements, land grabbing at its worst. The Israeli government has given the people of Al Khan al-Ahmar the choice to move to either of two locations: next to a garbage dump or next to a sewer plant. Al Khan al-Ahmar is not alone. About 225,000 Bedouin live in the Negev and are under constant threat of destruction by an Israeli government’s intention to build more settlements on Palestinian land. But the High Court of Israel’s order to demolish Al Khan al-Ahmar makes it the most vulnerable. Only time will tell if Bibi forces its destruction as he fights for a sixth term as Prime Minister. On February 5, 2019, the Senate passed S1, the Strengthening America’s Security in the Middle East Act. One section of S1 is called, “Combatting BDS Act of 2019.” This anti-BDS section would allow U.S. states and localities to retaliate against companies or individuals supporting the BDS (Boycott, Divestment and Sanctions) movement, an international nonviolent campaign, begun by Palestinians, to place pressure on Israel to end the occupation and establish justice for all Palestinians. Washington Memo, a blog of Mennonite Central Committee U.S., has made it possible to easily see how your senators voted on S1. The overall bill, including the anti-BDS section, passed overwhelmingly by a vote of 77-23. To see how your senators voted, yea or nay, click here. Ahmed Abu Artema is a Palestinian journalist who helped create the nonviolent Great March of Return in Gaza, which began on Friday, March 30, 2018 and continues to this day every Friday. The goal of the march is to end the 10-year-old Israeli siege of Gaza and allow Gazan refugees to return to their homes in other parts of Palestine and Israel. Israeli forces have killed well over 100 people and injured over 10,000 since the nonviolent protests began. The American Friends Service Committee (AFSC) is sponsoring a tour for Artema this spring to tell the story of the Great March of Return. To find out more about the tour schedule and venues, click here. If you are unable to hear Artema in person, you can live stream his presentation in the New York City tour stop on March 14, 2019 by going to the AFSC website. Since then, Israel has waged war on Gaza in 2012, 2014 and 2018. The Great March of Return, the nonviolent protests staged by Gaza citizens and begun on March 31, 2018 is now in its 44th week. Hundreds have been killed and thousands wounded, including last Friday, January 25 when on young Palestinian and 22 others were wounded, 14 of whom were children. Continue to pray for Gaza. As the vote on Senate Bill S1 approached, MennoPIN joined 15 other denominational Palestine support groups in a letter to all 100 Senators, pleading for the defeat of the measure. Officially entitled, “Strengthening America’ Security in the Middle East Act of 2019,” one section of S1 is called, “Combatting BDS Act of 2019.” This anti-BDS section would allow U.S. states and localities to retaliate against companies or individuals supporting the BDS (Boycott, Divestment and Sanctions) movement, a nonviolent effort, begun by Palestinians, to place international pressure on Israel to end the occupation and establish justice for all Palestinians. The letter sent to Senators is entitled, “U.S. Faith Organizations Protect their Right to Boycott,” and reads in part: “We are members of faith communities in the United States whose congregations and denominations have adopted resolutions to boycott products made in Israeli settlements—built on occupied Palestinian lands in violation of international law and longstanding official U.S. policy…We are alarmed by attempts to pass legislation in the U.S. Congress that would provide legal protection for states that are penalizing participation in nonviolent, grassroots Boycott, Divestment and Sanctions (BDS) movement for Palestinian rights…The anti-BDS legislation penalizes actions taken by the Presbyterian Church (U.S.A.), the United Methodist Church, the Mennonite Church USA…and other denominations.” Read the entire letter here. If you have not called your Senator to express your opposition to S1, please do so right away! MennoPIN strongly encourages trips to Palestine to see upfront the struggle Palestinians endure on a daily basis. Established justice tours usually last about two weeks and offer both visits to Holy Land sites as well as experiences with Palestinians and those who actively work for justice and freedom for the people of Palestine. Or you may want to plan a do-it-yourself tour. To find out more about tours, visit the MennoPIN website and click on the Tours to Palestine tab. CPT – CPT Palestine, with a long history of solidarity with Palestinians and documenting human right abuses in Palestine, has an urgent need for reservists and interns. For more information, contact Mona el-Zuhairi at monazuhairi@cpt.org. EAPPI – EAPPI-US provides protective presence to vulnerable communities in Palestine and monitors human rights abuses. For further information, see their website here. For an excellent Lenten resource for your church, study group or home, click here. Is Google Maps Erasing Palestine? MennoPIN wishes you a blessed Christmas as, together with you, we continue seeking justice and peace in Palestine/Israel! Texas is one of twenty-six states that have enacted laws preventing state agencies from contracting with individuals or companies who support and participate in the BDS movement, an international campaign started by Palestinians to put pressure on Israel to comply with international law and to respect the rights of people in Palestine. Go ahead and try it. Ask Google Maps to give you directions by car from Hebron to Jerusalem. No routes are given, just highlighting where Hebron and Jerusalem are. Then ask for directions from Jerusalem to Tel Aviv and you will be given several possible routes, all highlighted clearly. On other designated routes, the roads given can be driven only by people with Israeli ID or foreign passports, not by Palestinians. Google Maps essentially ignores Israel’s segregated road system. Now, back Google Maps out until you can see the countries named: Israel, Jordan, Syria, Egypt. The word “Palestine” is nowhere to be seen. For Google Maps, Palestine doesn’t exist. Never mind that in 2012, 138 of the 193-member states of the United Nations recognized the existence of the State of Palestine. Google Maps clearly disagrees. Now, notice the designated capital of Israel on Google Maps—Jerusalem. Google claims to be a company committed to human rights, but its mapping system advances the interests of the Israeli government and disregards those of Palestinians. Intentional or not, Google has erased Palestine from its maps. The faculty of Pitzer College in Claremont, CA has voted to suspend their study abroad program with Israel. Daniel Segal, the anthropology and history professor who initiated the motion, raised the issue because Israel violates student rights with a 2017 law denying entry to students who support BDS. The motion calls for resumption of the program once Israel ends it restrictions based on “ancestry and/or political speech” and begins to grant visas for exchange to Palestinian universities “on a full and equal basis” to how they grant such visas for Israeli students. The measure, apparently the first of its kind at a university in the United States, will be voted on next semester by students and faculty. If the new vote passes, hurdles still remain. The college’s president, Melvin Oliver, strongly condemned the initial vote. Whatever the end product, this is another important step forward in the growing U.S. movement in support of justice for Palestine. Christian Peacemaker Teams has had a continuous presence in the West Bank since 1995. In 2019, you will have five opportunities to participate in one of CPT’s two-week long delegations. You will meet Palestinian and Israeli human rights peace workers in Jerusalem and Bethlehem, visit Palestinian families whose homes and livelihoods are threatened by expanding Israeli settlements, and travel to Al Khalil (Hebron) and At-Tuwani (Southern Hebron Hills) and experience first-hand PT’s work alongside Israeli and Palestinian partners. You will also challenge the structural violence of the Occupation through nonviolent public witness. Find out more about delegation dates, costs and how to sign up, click here. For other 2019 learning tour possibilities to Palestine/Israel, please visit the MennoPIN website here. MennoPIN stands in solidarity with the Jewish community in Pittsburgh and around the country at this time of great sorrow and tragedy. The hatred and violence of Antisemitism has no place in our society. May love and grace surround all affected by this unspeakable act of violence. MennoPIN is an inclusive and anti-racist network that steadfastly opposes Islamophobia, Antisemitism, all forms of racism and any other expressions of bigotry directed at any person or group. The first ever Christ at the Checkpoint USA conference saw a variety of speakers and attendants including supporters of MennoPIN. Christ at the Checkpoint has been a biennial event put on by Bethlehem Bible College, encouraging Evangelical leaders to come to Bethlehem, and meet with Palestinian Christians to see firsthand the effects of their Christian Zionist theology. This year for the first time, the organizers teamed up with Oklahoma City based pastors led by Darrell Cates, to bring the experience to the United States. Speakers included representatives of Bethlehem Bible College, Jack Sara, Munther Isaac and Grace Zoughbi; well-known Palestinian Christian leaders, Father Elias Chacour, Alex Awad, Sami Awad, Mubarak Awad, and MennoPIN steering committee member Jonathan Kuttab; Jewish leaders in peace and justice work, Rabbi Michael Davis, and Mark Braverman; prominent American and international Christians, Bishop Robert Hayes, Bob Roberts, Gary Burge, Stephen Sizer; Mae Cannon, and the heroic Palestinian Muslim from Gaza, Dr. Izzeldin Abuelaish. A unique aspect of Christ at the Checkpoint is to allow those with conflicting views to be heard at the conference. The organizers invited the most prominent voice in the “New Christian Zionism movement,” Gerald McDermott. The conference’s many viewpoints still resulted in a clear portrail of the dire situation in the West Bank and the Gaza strip, the negative effects that colonial Christian theologies like Christian Zionism have had on the region, and the need for Christians to embody a theology of peace. To hear the sessions, or get more details about the conference, click here. Israeli Army Brigadier General Roei Elkabetz told a 2012 convention on border control in El Paso, TX, that “we have learned a lot from Gaza. It’s a great laboratory.” He was referring to Israel’s arms industry, the largest homeland security industry in the world. It is horrendous that a live, captive population of human beings are being used to test new and lethal military weapons to control populations and generate profits for the Israeli weapons industry. There is no doubt that the “deadly exchanges” of military practices between the United States and Israel have and will continue to benefit both country’s endless-war economies. +972 magazine reported that dozens of international activists protested in support of the Great Return March on the Israeli side of the Gaza border. Waving Palestinian flags and carrying posters, the activists, including Jews for Return and Coalition of Women for Peace, also held photos of Palestinians killed by Israeli snipers during the Great Return March. The Great Return March began on March 30, 2018 and is entering its seventh month. To read the entire report, click here. In the opening article, Sabeel probes the story of Jesus’ healing of the Gerasene demoniac: “While this passage does not deal with the issue of sexual harassment directly, we feel it has much to say about the way our society deals with demons—especially demons we’d rather not acknowledge.” To read the entire issue, click here. “I’m just home from a 15-day trip to Israel/Palestine led by FOSNA Board Co-Chairs, Michael Spath and Doug Thorpe. It was my second trip; I see even more clearly now the utterly comprehensive, systematic oppression of the Palestinian people. Now, I walk the lanes of our farm, seeking to reconnect with my rural Indiana community. The words of lament uttered by a traveling companion wash over me – “Who thinks up these things?” “These things” which craft an intentional, finely-tuned, overarching plan to eradicate all traces of a people – past, present and future. Gerard Horton & Salwa Duaibis of Military Court Watch provided graphic detail of what happens in the never-ending practice of night raids, the ‘softening up’ of children ages 12-17 by storming their homes at night, tying their hands with plastic straps, blindfolding them, throwing them on the metal floor of a military vehicle between/under the boots of soldiers, placing them in shipping containers for 10 hours, then facing interrogation and judges – some of whom are settlers. We learned of ‘The Expulsion Law’ (2016) which allows for the expulsion of Arab Knesset Members who make remarks or undertake actions that the majority claims incite to racism or support terror. On July 19, 2018 – The Knesset passed an addition to the body of Israel’s Basic Law. The ‘Nation-State Law’ granting special status to persons of Jewish faith. Another law, the ‘Citizenship Law’ is for non-Jews, institutionalizing discrimination, legalizing apartheid. Christian PeacemakerTeams (CPT) reports that three of its Palestine team members were blocked from entering Israel/Palestine. CPT places teams, at the invitation of local peacemaking communities, that are confronting situations of lethal conflict. These teams support and amplify the voices of local peacemakers who risk injury and death by waging nonviolent direct action to confront systems of violence and oppression. CPT has had a presence in Palestine for many years. 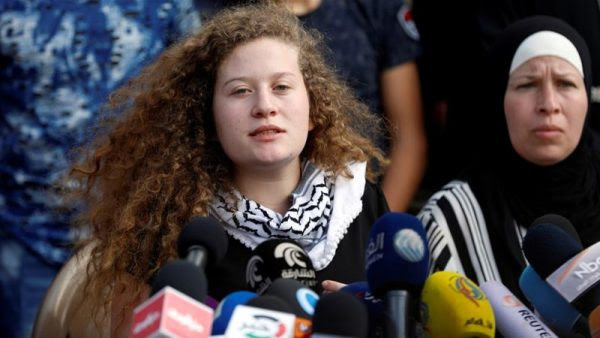 Although the 17-year-old Ahed Tamimi has gotten considerable international attention for her years of activism and eight months in prison, many other Palestinian women have also played a strong role in the resistance to the occupation but without broad recognition. In fact, the power of women in Palestine has never been stronger. Reem Anbar, 28, resides in Gaza City and chooses a musical way to counter the violence of Israeli military forces. Since she was a young girl, Anbar has played the oud, a short-neck lute-type, pear-shaped stringed instrument similar to the mandolin. When Israeli bombs would be dropping near her home, she would pick up her oud where the notes and rhythms would overshadow, at least for a while, the chaos outside her windows. After the war ended, she played for traumatized children at the cultural center and, later, she joined other artists to compose musical plays and performances for children to overcome trauma and promote their inclusion in society. The next two sections highlight more Palestinian women leaders. 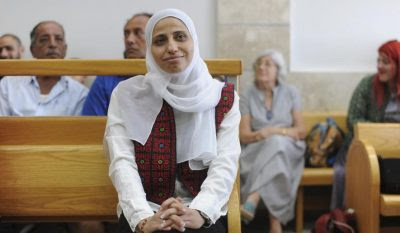 On July 31, 2018, Dareen Tatour, a 36-year-old Palestinian poet from Reineh, near Nazareth, was sentenced to five months in an Israeli prison, for writing a poem, a poem that Israel found objectionable, claiming the poem intended to incite violence. Tatour insisted that her poem was nonviolent and “about the settlers who kill and burn Palestinians.” More than 150 international literary figures came to her defense, including Alice Walker and Naomi Klein, but to no avail. Here is Tatour’s poem, “Resist, My People,” translated by Tariq al Haydar. The Old Town section of Hebron, located in the southern part of the West Bank, was built in the thirteenth century and is known as al-Khalil. The Israeli military in Hebron is increasingly targeting local nonviolent activists and recently arrested six women in al-Khalil, holding them in administrative detention. Administrative detention is incarceration without trial or charge, alleging that a person plans to commit a future offense. It has no time limit and the evidence on which it is based is not disclosed. Israel employs this measure extensively and routinely, holding thousands of Palestinians for lengthy periods of time. One of the women is a writer and another is a member of the al-Khalil municipality. Nearly 100 people regularly hold the above-pictured banner outside the detention center where they are held, calling for their release. The Great Return March, begun on March 30, 2018 is now five months old and is continuing. On August 24, 2018, 5,000 people attended the demonstration protesting the Israeli blockade of Gaza, denying Gaza citizens the internationally-recognized right to return to their ancestral homes. As they have consistently done, Israeli military forces fired upon the peaceful demonstrators, injuring nearly 200 people, about 50 from live bullets. Since the beginning of the Great Return March, at least 155 Palestinians have been killed and over 17,000 injured, many with permanent disabilities. On July 29, 2018, the Al Awda (The Return), carrying 114 boxes of medical supplies to Gaza and sailing under a Norwegian flag, was traveling in international waters, 49 nautical miles from the Gaza City port, when it was intercepted, boarded and hijacked by Israeli military forces. The 22 people on board the Al Awda came from 16 countries and included human rights supporters, journalists and crew. All were taken captive and released several days later. “It’s what pirates do,” exclaimed one of the human rights supporters aboard the Al Awda. Larry Commodore is a long-time indigenous rights activist and former elected chief of the Soowahlie native community near Vancouver, British Columbia, Canada. He volunteered to be part of the Freedom Flotilla taking desperately needed medical supplies to Gaza because he feels a deep connection between the way his people were forced into refugee status and how that has happened with Palestinians. The badly needed medical supplies never made it to Gaza. Mennonite Central Committee (MCC) has issued a special alert: Support the People of Gaza – Take Action. The alert invites all of us to ask our Congressional representatives to call for a lasting ceasefire between Israel and Gaza and support for the people of Gaza. To read the entire alert, click here. In the past month, three Jewish activists have been detained for their opposition to the recently passed Nation-State Law. Each had openly expressed strong disagreement with the law’s definition of Israel as an entirely Jewish state, with no mention of the value of democracy or equal rights for Palestinians. Peter Beinart, a writer, professor and political commentator, was on vacation, traveling from Greece to attend a family bat mitzvah, when he was detained by the Shin Bet, Israel’s security agency, when he arrived at Ben Gurion airport in Jerusalem. Israeli-born poet, Moriel Rothman-Zecher, also arrived at Ben Gurion airport with his wife and infant daughter, where he was warned that his involvement in nonviolent protests was a “slippery slope.” He wondered how he would explain the incident to his daughter when she was older: “Hey kid, on your first visit to Israel, you father was detained at the border because he thinks Palestinians are human beings deserving of equality.” One week later, Simone Zimmerman, a founder of IfNotNow, an organization of young American Jews fighting Israel’s occupation of the Gaza Strip and West Bank, was detained at the Taba Border Crossing between Israel and Egypt. 1. Razan Al-Najjar was a 21-year-old medical volunteer shot dead on June 1, 2018 by an Israeli sniper as she tended the wounded in Gaza during the Great March of Return. Claudia Patricia Gomez Gonzalez was a 20-year-old woman from San Juan Ostuncalco in Guatemala who was also shot dead on May 23, 2018 by a US Border Patrol agent as she marched to a safer and better life in the US. Within eight days of each other, these two young women (photograph above) were murdered at a border, Razan on the Gaza/Israel border and Claudia on the Mexico/US Border. 2. Israel and the US have state-enforced policies to separate children from their families and hold them in detention. Several hundred Palestinian children languish in Israeli prisons and several thousand Central American children suffer detention in cages in the United States, all forcibly separated from their families. 3. The building of racist walls of separation in Israel and the planned expansion of walls on the Mexico/US border involve two Israeli corporations: Elbit and Elta play a significant role in building both walls. 4. The Trump and Netanyahu collaboration with dangerous exchange programs bring together police, ICE, border patrol and the FBI from the United States with soldiers, police and border patrols from Israel for training in control and intimidation tactics and the use of lethal force. Earlier this year, Esther Koontz, a Mennonite school teacher, filed a lawsuit against the State of Kansas when she lost a job opportunity because she would not promise to not boycott Israeli corporations or institutions that participate in the oppression of Palestinian people. Esther told MennoPIN that after the injunction against the Kansas law took effect, “the state of Kansas passed a new law stating that the anti boycott certificate only applies to companies (not individuals) and only those with contracts over $100,000. Therefore, the law no longer applies to me, so I can no longer be a plaintiff. My lawyers will likely be dismissing the case on our terms.” Stay tuned for further developments on Esther’s case. US lawmakers from both houses of Congress and both sides of the aisle have introduced legislation to make criticism of Israel on campuses and at other educational institutions equivalent to antisemitism. The current legislation (H.R.6421 and S.2940) is entitled: “Antisemitism Awareness Act of 2018.” While antisemitism is clearly on the rise in the United States and needs to be addressed and condemned, this bill effectively outlaws expression of a political and moral opinion critical of policies and actions by the government of Israel as antisemitic and illegal. Some states are also crafting similar legislation. MennoPIN encourages you to contact your congresspeople to express opposition to these bills. The US Campaign for Palestinian Rights has launched a new campaign called Cities for Palestine. Palestinians in the West Bank (including East Jerusalem) and the Gaza Strip are beginning their 51st year of brutal Israeli military occupation. As resistance builds across Palestine, the US Campaign is encouraging people in the United States to seize opportunities to organize for Palestinian rights in our cities, towns, counties and states. The municipalities approach has worked before, in the South African anti-apartheid movement and environmental justice campaigns. Go here citiesforpalestine.org to get eight ideas on how to start a campaign and a toolkit to help implementing a municipal campaign in your community. The Mennonite Central Committee (MCC) sign a statement along with fourteen other church and church agency bodies in support of the right of return for the people of Gaza. Referring to the Great Return March, the statement affirms that “the Gaza demonstrations are an assertion of Palestinian rights: the rights of refugees, the right to demonstrate peacefully against injustice, and the right to live in and with dignity, not under closed military confinement or blockade.” Read the entire statement here. The MCC Washington Memo also offers “Take Action” ideas to “Tell Congress: 70 Years of Suffering is Enough.” Go here and tell your congresspeople what you think! The first Christ at the Checkpoint Conference in the United States will be held in Oklahoma City, OK October 15 – 18, 2018. Since 2010 Palestinian Christians have held an international Christ at the Checkpoint Conference at Bethlehem Bible College in Bethlehem, Palestine every other year. Organizers of the U.S. conference feel “compelled to address the injustices that have taken place in the ongoing conflict between Israel and Palestine, particularly the Palestine lands under occupation…We believe that standing up nonviolently to injustice is an acceptable expression of our faith.” For more on the conference and to register, click here.